Which one of the following diagrams represents correct relationship among sparrow, birds, and Kite? 2. How many meaningful English words can be made with the letter’s ‘X Y E NL O’, using each letter only once in each word? Words can be formed using the letters “XYENLO” – No, on, oxen and ox. 3. If 1 bird from group 1 is come to group number 2, then the group – 2 has twice the number of birds that in group 1 has. If 1 bird from group 2 is come to group – 1, the group – 2 and group – 1 have to same numbers of birds. How many birds were there in group I and group II and what is their G.M? 4. Ramesh is taller than Arun who is shorter than Sunil. Guru is taller than Santra but shorten than Arun. Sunil is shorter than Ramesh. Who is the tallest? Ramesh > Sunil > Arun > Guru> Santra. So, Ramesh is the tallest. 7. In a certain code language – A * B denotes A is father of B A – B denotes A is mother of B A÷B denotes A is brother of B A ×B denotes A is sister of B In, P ÷Q×R * S, How P is related to S? 51, 52, 48, 57, 42, ? 9. How many such letters are there is the word ‘PSYCHOPHANT’ each of which is as far away from the beginning of the word as when they are arranged in alphabetical order? Here we odd different prime number in each letter starting from the. 1) Which one of the following diagrams represents correct relationship among sparrow, birds, and Kite? 2) How many meaningful English words can be made with the letter’s ‘X Y E NL O’, using each letter only once in each word? 3) If 1 bird from group 1 is come to group number 2, then the group – 2 has twice the number of birds that in group 1 has. If 1 bird from group 2 is come to group – 1, the group – 2 and group – 1 have to same numbers of birds. How many birds were there in group I and group II and what is their G.M? 4) Ramesh is taller than Arun who is shorter than Sunil. Guru is taller than Santra but shorten than Arun. Sunil is shorter than Ramesh. Who is the tallest? 5) What should come in place of? 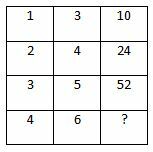 6) Find the missing number? In, P ÷Q×R * S, How P is related to S? 9) How many such letters are there is the word ‘PSYCHOPHANT’ each of which is as far away from the beginning of the word as when they are arranged in alphabetical order?